Confession time: I actually finished this two weeks ago. I've been meaning to take photos every day since then, but other stuff has just been popping up. You know, homework, rain, dance, procrastination. Actually, the rain just started yesterday. We had a little bit of a heat wave last week. It went up to 31 degrees the other day! (Everyone in the US reading this is probably thinking, what?!? 31 degrees? That's hot? I know how it is. I do a double take when someone says that the temperature dropped to 50, or that it was 90 the other day. I don't think in Fahrenheit. Water doesn't freeze at 32 degrees. It just doesn't.) Anyways, it was nice to get a little more wear out of my summer clothes. This is my third Pendrell blouse, and, like my culottes, was a bit of an experiment. I had some red polka dot bamboo jersey lying around that my mom bought a while back, and I wanted to make it into a top, but didn't really have a good pattern for knit tops. I believe my mom was planning to make this into a second camisole for me, after self-drafting one last year. Even though I wear the cami a lot, I've decided that camis don't work so well for my body type. I need them to give enough coverage in the front, and yet sit below my shoulder blades in the back... which doesn't seem to work. Even though we fitted the cami to be like that, gravity does its thing and the neckline sinks lower and the back rides up. Sigh. I was actually planning to make the Maria Denmark Day to Night Drape Top with this, since I have a black polka dot shirt that's quite similar to this pattern and gets quite a bit of wear. But... I kind of forgot about that until halfway through making this. Oops. I had a fair chunk of time to spend sewing, I was not in a mood to finish my culottes, I saw this fabric just sitting there, and this seemed like a good idea at the time. Now, this top is designed for drapey wovens. It has no zipper and is therefore very blousey - which I love, but I find that it really needs to be tucked in to be the most flattering. Since I wanted this to be a casual piece for layering, I thought I would probably be wearing it untucked with cardigans, and therefore wanted it to fit nice and snugly. I couldn't exactly size down since I make a straight size 0 in Sewaholic patterns, so I just took generous seam allowances (1", to be exact). And yes, I realize that princess seams are unnecessary for knits, especially jersey knits with as much stretch as this one, but it was the best pattern I had and I wasn't feeling up to self-drafting something. I'm still kind of astounded that I managed to cut this out without sacrificing anything, and I'm still not entirely sure how I managed it. I somehow was able to squeeze it out of 0.6 metres of fabric instead of the recommended 1.8. A big part of it was not cutting the neck and armhole binding on the bias, being a knit. I also shortened it by 2", just like in my other versions. Still, I don't think I've ever had such an efficient layout - when I was all done, I barely had enough left over to try some sample seams. I was planning to make the sleeveless version as an alternative to a cami, but realised there was a little empty square that I might just be able to squeeze some sleeves out of. The Pendrell cap sleeves for view B didn't fit, but my pattern pieces for the Alma blouse just happened to be sitting on my cutting table waiting for a FBA. Looking through the pieces, I realized that the cap sleeves for view A would just fit into that little empty square. I had no idea if they would be compatible with the pattern, but figured it was worth a try. They did end up working out nicely, although since I couldn't line up notches, they are a teensy bit uneven, but I don't think it's very noticeable. I only noticed this yesterday, when I took the photos of it flat. I also think I gathered them a little bit more than on the original pattern, again, because I didn't have notches to match them to. Overall, though, I really love them! They have a different look in a knit, but I think they really suit the polka dots. They are cute and very flattering, as opposed to the plain cap sleeves that are usually found on knit tops. I think that I'll get a little more wear out of this with sleeves, because it just feels a little more complete. Without, I think it would feel like I would need to wear a cardigan with it. I still can because the sleeves aren't bulky, which makes this a pretty versatile piece. I must say, even though I've made this twice already (past versions will probably be blogged about at some point), I struggled with this version. It should have been fast and easy, but it most definitely wasn't. Why? It's a knit. I really, really hate sewing with knits, and especially jersey knits with quite a bit of spandex (I don't know the exact fiber content, but this is suuuper stretchy. I would hazard a guess at 8-10% spandex. It's stretchier than a knit rayon top I have that is 8%, anyways). On a bit of a side note, when I was younger I sewed almost exclusively with knits, because I had some weird idea in my head that they were easier to sew with than nice, stable wovens. I have no idea why. 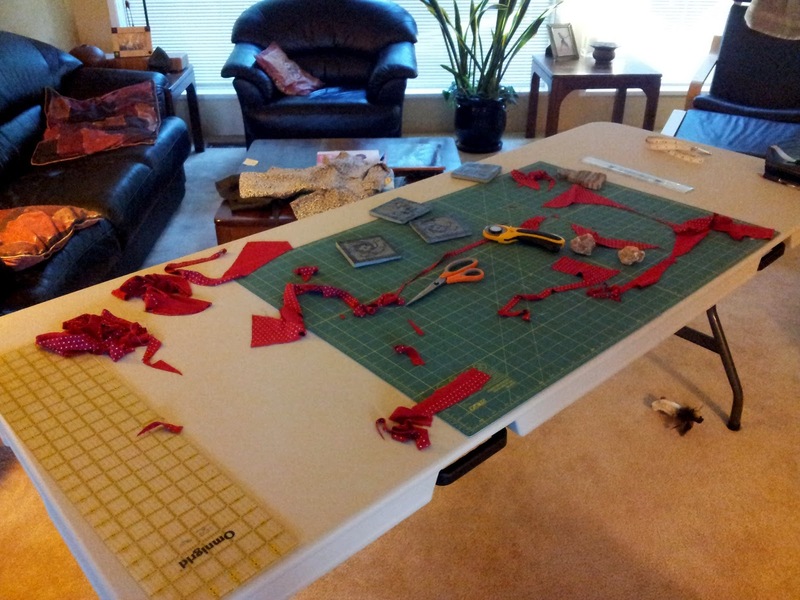 All that time, I thought sewing was a lot more difficult than it actually is, because I only sewed with knits. Now, I sew pretty much exclusively with wovens. The seams themselves weren't too bad, I just used a slight zig-zag and serged the edges, but the topstitching for the neck and armhole binding drove me crazy. I used a double needle because I think it looks nicer than a zig-zag, but it took me lots of tries (and quite a bit of unpicking) to finally get it perfect good enough. It still puckers a little bit in a few places, where the second needle didn't catch the binding underneath. This probably wasn't the best way to finish the neck, but I wanted this to be a quick project, so I just went for it. Isn't it funny how so often the things we do to make things "faster" end up taking so much time? It's definitely not my best handiwork (the above picture it one of the better parts), but I'm still pretty happy with it. It fits, in comfortable, and it's very wearable. I have to admit that even though anything I sew that's knit is never particularly well-made, they still get quite a bit of wear. One thing I noticed about this top after I finished was that it's actually really bright! I know what you're thinking. Of course it's bright. Duh. It just seems brighter now that it's a top, oddly enough. It didn't look quite that bright when it was just fabric. I still really like it, especially with a cardigan to tone done the brightness a little bit. 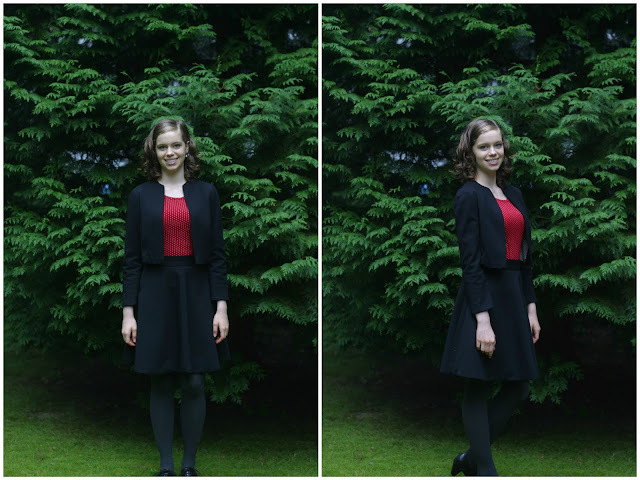 I, of course, styled it with a skirt for these photos, and then realised that I would be wearing it far more often with jeans and a cardigan, so I changed and took some photos like that too. It can be dressed up or down pretty easily. When I added the bolero/blazer (it's kind of a combination of the two, so I call it both, depending on how I feel), it reminded me of the outfits I would wear for band concerts back when my band teacher said that girls had to wear all black, but guys could wear whatever colour dress shirt they liked. A bunch of the girls in band decided that this was completely unfair, and wore coloured shirts anyways. Shortly thereafter, he gave up telling the girls they had to wear all black. I think I bumped the tripod, so I cut off my feet in this photo... but you get the idea. I do really love this pattern, even though it's not really the same pattern after taking so much out of the seams and changing the sleeves. As I mentioned before, I've made two of these already and love them both. Also, the skirt I'm wearing in these photos is the Sewaholic Hollyburn. Can anyone tell I like Sewaholic patterns? I've seen loads of pendrells but like yours the best! that's due to the changes you made. I love the fit, just hoe I like a blouse and the sleeves, the gather suits the fabric beautifully. I really like how this top came out in a knit, it looks great on you. I've not worked with any Sewaholic patterns, yet, byt a few of themy are on my wishlist. Thank you! 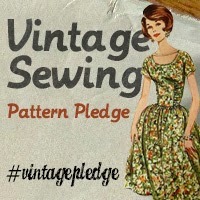 I would highly recommend any of the Sewaholic patterns that I've tried so far. All of them (Pendrell, Alma, Cambie, and Hollyburn) have turned out great and get a lot of wear. I love this shirt, especially the sleeves! It looks so great on you as well. Great job!